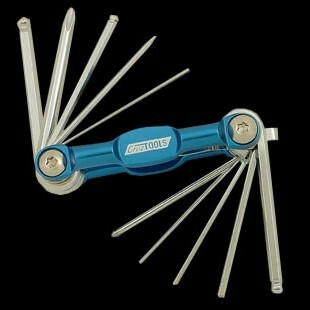 The first multi-tool for guitars and basses that's actually useful, without unnecessary gimmicks. Whether you have the USA or imported axe, we've got you covered for most bridge, truss rod, and other adjustments. Includes four metric and three fractional hex keys, two Phillips screwdrivers, a 2.5mm slotted screwdriver, and ruler for setting action. Truss rod sizes are ball-end for easy access. 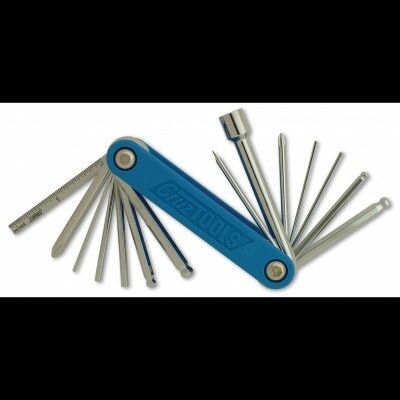 All keys are pro-grade, using a heat-treated S2 material with a polished chrome finish.